2016 was a big year for me. I got my first horse. Getting your first horse is an exciting moment for many young equestrians and one I will never take for granted, however I have to admit I wasn’t overly excited to go from the ponies to the horses. It seemed like a step closer to growing up. Like Peter Pan, I enjoyed being forever young. I had just turned 13, what was the rush to leave the pony world behind? 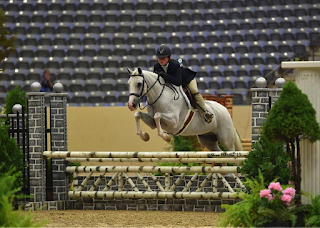 Maggie & Shaded (Scooby) competing in the 2015 Pony Medal Finals. 1. The Bows. What goes hand in hand with ponies? Bows, bows, and more bows! I loved wearing hair bows and I could express myself through my choices. I love dogs and promote animal rescue so my favorite bows were my Danny and Ron’s Rescue bows from Belle and Bow Equestrian and my Chihuahua cross bone pair. 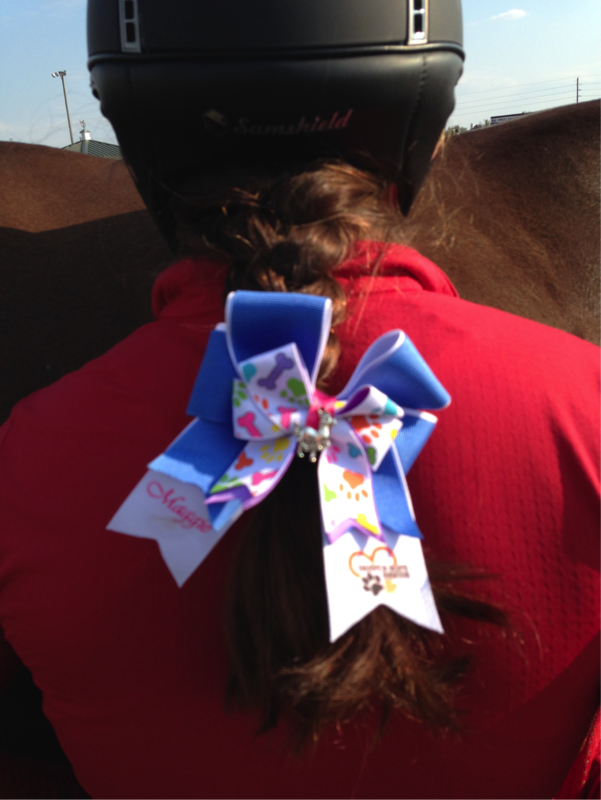 The bows were the first to go once I started in the Large Pony Hunters. I missed them. Bows were easy. Throw two braids in, gel my hair, tie the bows in place, and off I went. Now I had to put my hair up. Okay, so now that we are discussing my hair, let’s just say I have a lot of it! It’s like wrestling a wild lion. Once I finally get it lassoed under the hair net, I finally have to squeeze into a helmet two sizes bigger than my last to fit it over my hair. 2. Paddock Boots. I was finally getting adjusted to the new hair situation and should have been prepared for what would come next… my trainer's suggestion it was time for tall boots. Ugh! Most kids can’t wait for their tall boots. Much like getting your learner’s permit at 16, it’s a monumental event! Well, not for me. Okay, so maybe I don’t like change, but I also have a serious issue with comfort. I loved my paddock boots. They fit like a glove, maybe a little too snug because I refused to get a new pair, but they were just fine. Now I had to go boot shopping. That actually wasn’t as painful as I had feared; however the break-in period was. Band-Aids were my new best friends and only after several weeks was I finally able to walk in them. Cleaning them is a whole other story. Five minutes and my paddock boots were polished. My tall boots require at least a half hour, lots of patience, and even more polish. 3. Easy Mounting. I had my tall boots for one month when my trainer asked me to ride a new horse he had in the barn. I had only ridden a horse once before. Why did Tommy look so big? Why did he raise his head like a giraffe when I was tacking him up? Forget these new tall boots, I needed high heels! I could barely slide Tommy's bridle over his ears. Speaking of ears, where did those cute little pony ears go? I was now struggling to get a bridle over mammoth size Warmblood ears. Once I finally got the tack on I was beginning to feel accomplished, until I walked out to the mounting block and immediately realized my next challenge. I needed a stepladder. To make matters worse, Tommy wouldn't stand still and squirmed side-to-side to challenge me even more. I finally made my way into the saddle and off we went for our lesson. I felt really small on him and wasn’t sure of what to expect after all the effort it took to get to this point. I guess Tommy felt like he had tested me enough and he behaved like a perfect gentleman that first lesson. I spent the month getting to know him and we seemed like a good match. My parents surprised me by purchasing him right when we were ready to leave for winter circuit in Gulfport. I was thrilled. I was taking Scooby and Tommy was now coming too. I had really begun to love Tommy. I was finally getting used to my tall boots and my tall horse. Things seemed to be coming together... or so I thought. 4. Pony Striding. I had never really jumped a three-foot course on Tommy. But how hard could it be? I jumped three-foot on Scooby all the time. But on a horse, things are different. First, I had real trouble with pace. 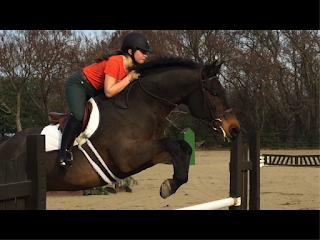 I was used to ponies that have some motor; now I had this big barreled Warmblood. My trainer insisted I had to learn to use my leg. I have been riding and playing soccer since I was four years old. My legs should be pretty strong, but apparently they weren't strong enough. Without pace, I could no longer find a distance. It was there and then it wasn’t. It took time for me to learn how to keep the pace and find the distances with Tommy. Maggie & Tommy ended up Champion and Reserve Champion weeks 5 and 6 in Gulfport. For me moving from ponies to horses wasn’t an easy transition. I had to give up things that I loved, move out of my comfort zone, and challenge myself. Now, I don’t miss the bows as much. Tall boots are finally comfortable, and I have found love in a great horse--big ears and all. So in the end, maybe I'm not like Peter Pan. Maybe I am ready to grow up, and maybe, just maybe, I am finally ready to say goodbye to ponies and pixie dust. 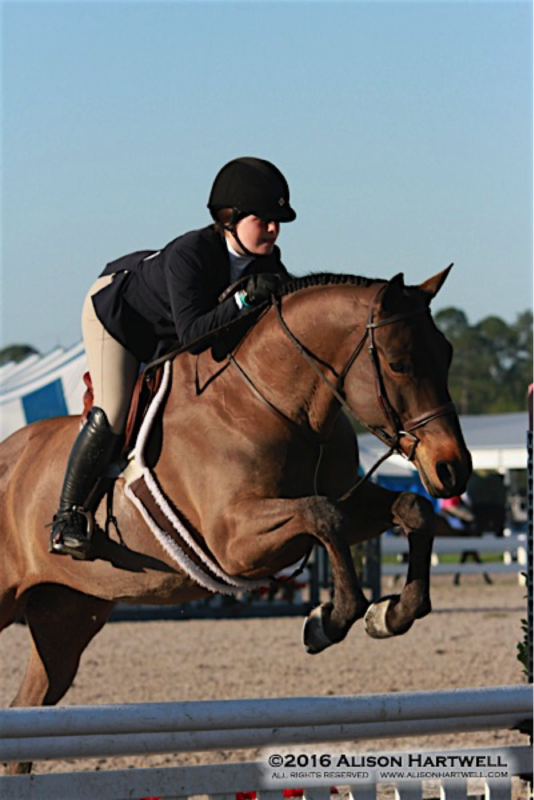 Maggie Junkin is a 13 year-old who competes in the Large Pony Hunter Division with Shaded and the Children’s Hunter Horse Division with Tommy Bahama. She is committed to animal rescue. Her favorite rescue to support is Danny and Ron’s Rescue. 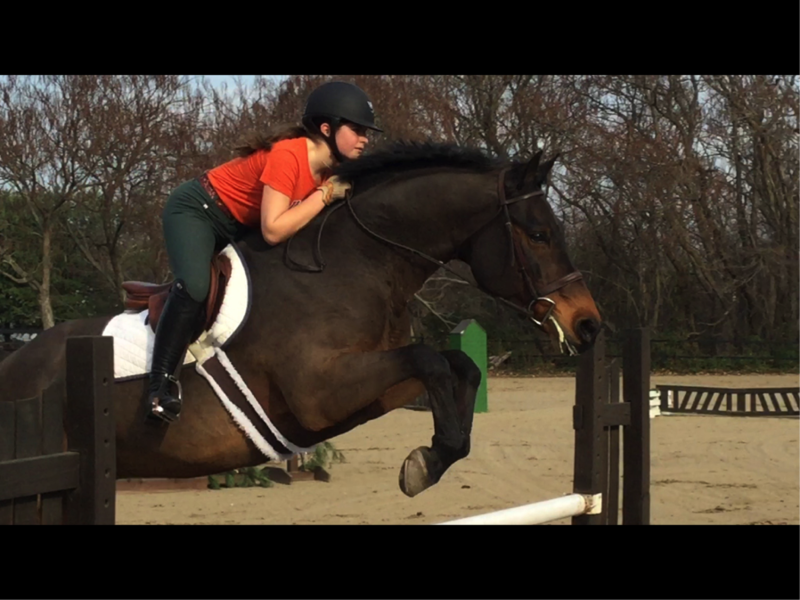 Maggie trains with John Mastriano of Tustin Farm in NJ. She lives with her family, five dogs, and three cats in Jenkintown, Penn. Maggie is thrilled to have qualified Shaded in the Large Pony Division for The Devon Horse Show 2016.